Cocoa Beach Surf Company carries the latest beach-inspired, footwear and clothing lines for men, women and children. Whether you are hanging out on the beach, cruising in the Caribbean or socializing after dark we offer a little bit of Florida for everyone. The Cocoa Beach Surf Company has everything you need for the beach. Hailed as the world's largest surf complex offering over 1,500 surfboards, one-of-a-kind clothes, surfing lessons by resident pros, beach rentals and more, Cocoa Beach Surf Company also features the Shark Pit Bar & Grill with it's 5,600 gallon Shark & Exotic Fish Tank, a Starbucks, and the Four-Points by Sheraton Cocoa Beach.We invite everyone to “Live the Life” of Cocoa Beach! 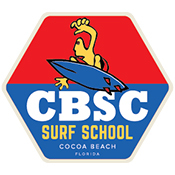 There's no better place to learn how to surf than on legendary Cocoa Beach. And Cocoa Beach Surf Company has the best instructors around. Whether you want to rent surfboards, chairs, umbrella or a kayak, our Beach Rental Store is always available to you. Want to hit the waves on your own? All of them are full-time surfers and many of them are former pros in the sport. Private and Group lessons are available by calling (321) 868-8966. Our Surf Camp’s mission is to cultivate a love and respect for the ocean by building confidence, developing character and inspiring stoke through safety, fun and learning. Joins us now! Experience the Cocoa Beach on a bike. Make sure you ask about locks, baskets, and other accessories you might need on your adventure! Want to have a fun day activity? Enjoy kayak our rentals. We offer both single and double kayaks, you can tailor your trip exactly to your family’s specific needs. Rent a surfboard for a day, week, or the rest of your vacation. Don't settle for something sitting around at the hotel - get a good board from CBSC Rental. Why ruin your vacation with a sunburn and with a sore back from laying on the ground? Rent beach chairs and umbrellas today from CBSC Rental. Brick-oven Pizza, Diner-style Burgers, Street Tacos and a few delicious menu surprises served by friendly folks. We carry the top surf and beach lifestyle brands including the latest clothing trends and the very best gear. You don’t have to be a surfer, but you will feel like one with awesome swimwear from Rhythm, Katin, Body Glove, Koru and many, many more. Keep your feet protected but cool with all-purpose footwear from KEEN, Teva, Merrill and Sperry. Look cool in Ray Ban, Native, Hobie, Shwood and Dragon sunglasses. We carry performance wear and rashguards from Columbia and Salt Life; and we are the largest retailer of Life is Good merchandise. And, yes, we have boards galore. Surfboards of every shape and size including the best value for your money with our own brand of custom shapes but durable construciton. We carry SUPs, kayaks, body boards plus all the accessories to get you out on the water! And stay safe with top brands of skin care. family vacations, romantic getaways, and Cruise Trips. Discover, eat, shop, stay at Cocoa Beach Surf Company. A place where adventures are made, pristine shores are abundant and nature is close at hand. Lose the traffic, the city noise and the crowd, and discover the perfect vacation. Enjoy it whether hot or cold.